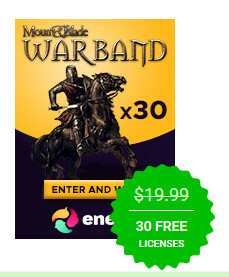 Win one of the 30 licenses for Mount & Blade: Warband! Mount & Blade: Warband is an ultimate sandbox RPG experience like none other. The game was released in 2010 and throughout nine years of its existence earned numerous praises and awards for excellence. In Mount & Blade: Warband you'll be able to enjoy extended political options, the ability to establish your own faction or participate in the 64-player battle in various different multiplayer modes. While the game doesn't have a restricting storyline, it has some awesome lore elements. This means that players can go out and do whatever comes to mind in a massive world, which gives Mount & Blade: Warband massive replayability value. 5 days or less time remaining..